Senior Cardiff Metropolitan University staffs were in India earlier this week to sign an agreement to develop Art and Design courses to be offered in India. 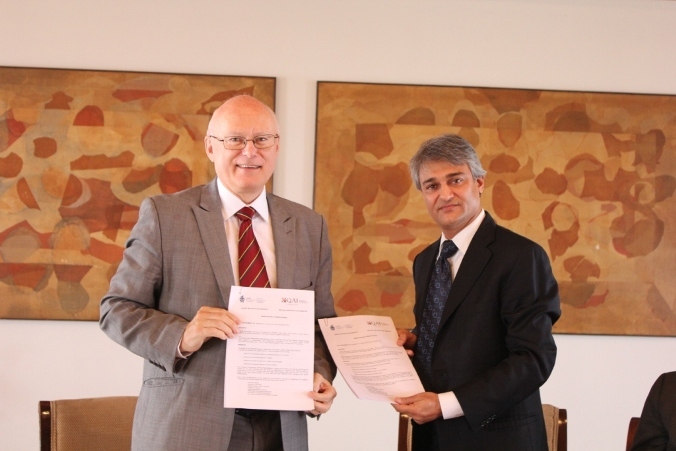 The University’s Vice Chancellor Prof Tony Chapman and Pro-Vice Chancellor (Internationalization), Professor Mohamed Loutfi, signed an agreement to work with Qualifications and Assessments International (QAI) to develop Diploma and Advanced Diploma programmes in Art and Design to be offered in India. Once finalized, the programmes will enable students to transfer to study degree courses in Cardiff or to complete their degrees in India at approved centers. QAI is a private and international awarding body that offers a range of academic and vocational qualifications and assessments for specific purposes including Skills assessments for Employability and English language. The agreement to develop Art and Design programmes in India builds on the previously-approved QAI qualifications in Business and Management and Hospitality and Tourism, which have been approved by Cardiff Met for advanced entry onto the University’s degrees. These QAI awards are overseen and quality assured by the University. QAI also collaborates with the University to offer an English language test to Cardiff Metropolitan University which is used by the University to assess language proficiency for its international students. Sanjay Malaviya, Director of QAI stated that: ‘Our collaboration with Cardiff Met has been a great success and we are excited about the huge opportunity for offering Art and Design programmes in this vibrant and growing market. The creative arts are a booming area in India and we hope to offer programmes that will contribute to the on-going success of the industry. Cardiff Metropolitan University has been pioneer in introducing cutting edge concept in Art and Design. Accredited by the Massachusetts Institute of Technology (MIT), FabLab Cardiff builds on the experience of the global Fab Lab network, as well as the research and technical expertise of Cardiff School of Art & Design.